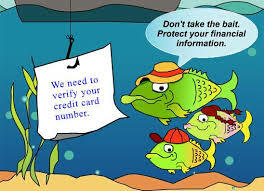 Phishing scams try to trick you into providing sensitive personal information e.g. your credit card or bank details. The scammers do this by sending you an email disguised as an official request for information. They’ll pretend to be a legitimate company – often one that you actually do business with – and they might create a website that closely resembles the company’s official site. The scams can be very good – and look very authentic – so it can be easy to get taken in if you’re not careful. There are often more phishing emails sent at this time of year – the scammers know we’re busy with our online shopping – and that some of us could be easy targets. It can take months (or years) to clear your name if you become a victim – you might need to sort out legal issues, recover from debt and repair damaged credit ratings – so it’s best not to get caught. Companies, banks, Heriot-Watt University and other genuine institutions WILL NOT ask you for, or ask you to confirm, your credit card or bank details, PINs or passwords by email. If you receive an email that you want to check out, phone the company to find out if they have sent it (using a phone number from correspondence you have already had with them – not by using one in the email you think might be a scam).